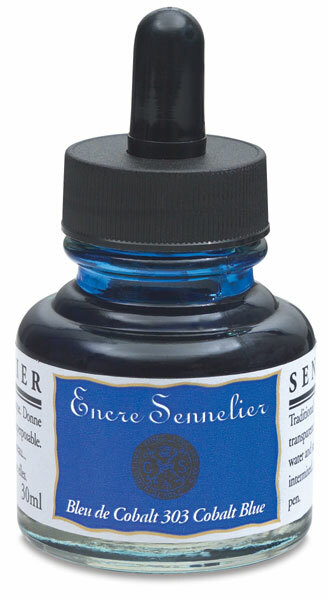 This shellac-based ink is waterproof and dries to a sateen finish. It is great for both watercolor illustration and calligraphy. Colors are blendable and can be reduced with a shellac-based thinner for various techniques. They have a high degree of water resistance without being indelible. Set of 4 — This set contains 4 colors in 30 ml bottles, including one each of China (Black), Cobalt Blue, Sepia, and Walnut Stain.